The reign of Japan’s next emperor, set to begin later this year, will be known as the “Reiwa” era, the Japanese government announced in a public statement on Monday. Crown Prince Naruhito is slated to succeed incumbent Emperor Akihito, who will formally abdicate the throne on April 30. Akihito’s reign was known as the “Hesei” era. The new Reiwa era will begin on May 1, with Naruhito’s coronation. A formal enthronement ceremony for the new emperor will take place later in the year. 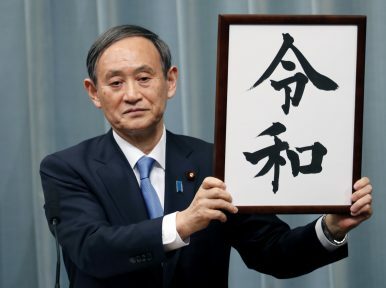 The Japanese press was quick to underscore that the Reiwa name, which includes the kanji character for “harmony,” was the first-ever name for an imperial era that does not find its origins in Chinese literature. The Japanese government has not publicized the process by which it came to decide on the Reiwa name. In December 2017, the government of Japan announced that Akihito, due to his worsening health and age, would voluntarily abdicate the throne. His abdication will be the first in the Japanese Imperial family since 1817. The 59-year-old Naruhito will become the 126th member of the continuous dynastic succession in Japan. The Japanese imperial system is the world’s oldest to still exist. Following the transition, Akihito will be known as the Hesei emperor for the era over which he presided. The Hesei period was preceded by the Showa period presided over by Emperor Hirohito, Akihito’s father. Some analysts have noted that the Japanese government’s choice to include the wa character is meant to evoke continuity with that era though neither Abe nor Suga drew that comparison. Japan’s Emperor Hints at Abdication in Televised AddressJapan's Emperor Wants to Abdicate, But That May Require Legal ReformsUS-Japan Trade Agreement Negotiations: Why Now?Is Japan Anti-China?South Korea and Japan: Where to From Here?